Despite being a historian of Islam and the Middle East with three books published on those topics, I decided some time ago to write on Middle-earth—and the first of my two complementary Tolkien volumes, High Towers and Strong Places: A Political History of Middle-earth, was recently published by Oloris. The follow-on work, Bright Swords and Glorious Warriors: A Military History of Middle-earth should be out early 2017. Following are some interesting political and military aspects of Tolkien’s world, gleaned from his many writings which I researched for these books. 1) The Lord of the Rings [LotR] is the account of a great war in about 4000 BC that takes place in the western part of the Northern hemisphere. Tolkien wrote that the events of The Lord of the Rings, The Hobbit and The Silmarillion took place in the ancient history of our world, and specifically that Sauron’s final defeat, which occurred in year 3019 of the Third Age, was about 6000 years before our time. Thus, Aragorn’s reign as King Elessar of the Reunited Kingdom of Gondor and Arnor until Fourth Age 120 would have fallen in the Late Neolithic/(very) early Bronze Age. But the Second Age lasted over 3,400 years and the First almost 600. In addition, before these “years of the Sun”, there were the more mythological “years of the Trees”—thousands of years of history that may or may not have corresponded to solar years. Thus, Middle-earth is, in effect, ancient Europe, with civilizations much older than the Greeks, Romans or even Minoans, and populated by races of sentient beings that have since died out or gone away (Elves, Dwarves, Hobbits, Orcs). 2) The most powerful kingdoms in Middle-earth for most of its history were human ones. Despite the Elves’ glorious hair and superhero-like abilities—as in the Peter Jackson movies—and the Dwarves’ reputation as the hardiest warriors, the greatest kingdoms ever created in Middle-earth were those of Men. In the Second Age the Atlantis-like human kingdom of Númenor was the most powerful in the world in terms of both naval and land power. The Númenóreans were 7-feet tall, built ships that plied all the seas of Middle-earth, wielded steel bows and so cowed the armies of Sauron that at one point they ran away, leading to the evil demi-god being taken captive. Unfortunately for Númenor, its arrogant King Ar-Pharazôn was convinced by Sauron to invade the far western land of Valinor, where the immortal Elves were allowed to sail in order to dwell with the angelic Valar. This resulted in Númenor’s complete and total destruction. But refugees from there, led by Elendil, escaped to Middle-earth and organized the extant Númenórean colonies into the Kingdom of Arnor and Gondor. By the middle part of the Third Age, almost all of Middle-earth was part of this benevolent empire—and although Arnor was eventually destroyed thanks to the machinations of the Witch-King, a diminished but potent Gondor survived and led the resistance coalition against Sauron for another 15 centuries—until its glory was restored and it was reunited with its northern cousin, Arnor, under Aragorn’s reign. 3) Many types of political systems existed in Middle-earth—not just monarchies. 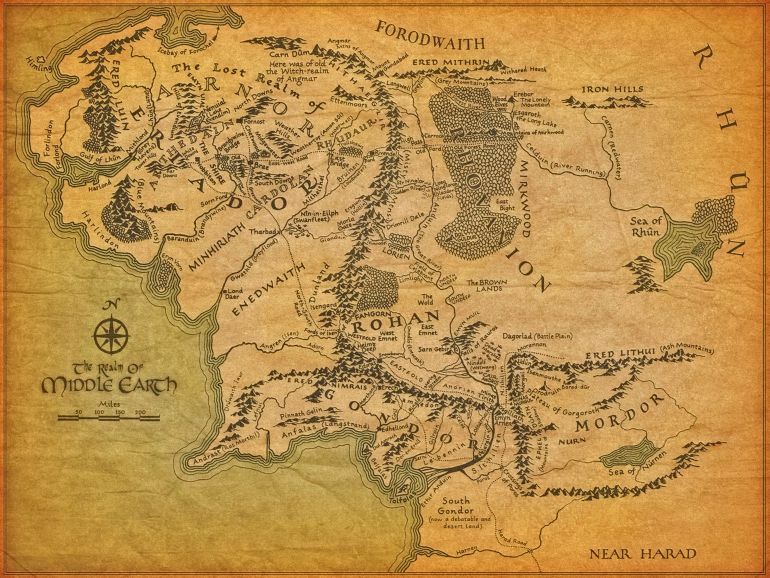 Over seven millennia of recorded history, Tolkien’s world was home not just to monarchy, feudal (Gondor and Arnor, Rohan) and otherwise (Erebor, Moria), but also despotism (Númenor under Ar-Pharazôn), aristocracy (Rivendell), oligarchy (Blue Mountain Dwarves), benevolent dictatorship (Lórien), representative democracy (the Shire’s mayoralty), nomadic chiefdoms (Easterlings), and theocracy (Sauron’s Mordor and the First Age dark empire of his mentor, the satanic Morgoth). In general, the good polities (men of Gondor and Rohan, Elves, Dwarves and Hobbits) possessed not just functionality and rule of law but at least some measure of accountability to subjects, whereas the bad ones were usually simply utilitarian, whether narrowly and basely (Orcs) or somewhat less so (Easterlings, Haradrim). 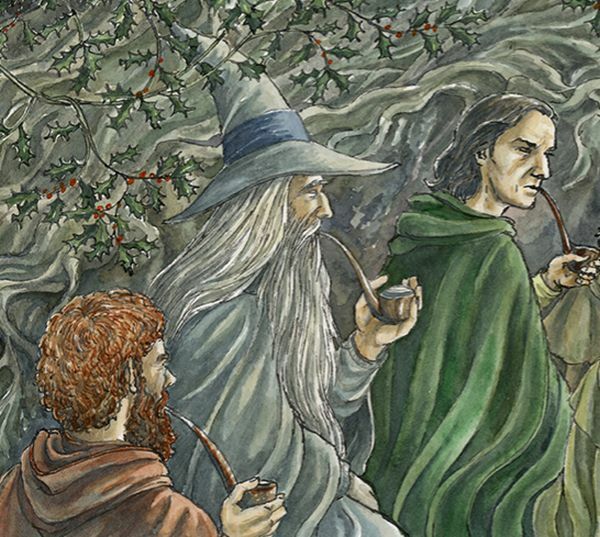 Gimli, Gandalf and Aragorn – three different ‘beings’ smoking together. 4) Middle-earth’s international relations were complex. The IR paradigm of polarity applies quite readily to Middle-earth. The First Age was one in which the first Dark Lord, Morgoth, created a literal Hell on Arda (“earth”) and used that as a base from which to impose his direct unipolar rule, not just hegemony, over all Middle-earth. Despite the heroic efforts of the Elves and their allies of Men, he would have succeeded had not the Valar, the one god Eru’s angelic deputies, intervened with massive, cosmic power. The Second Age was one of bipolar, dueling hegemonies: in the west and coastlands of Middle-earth, Númenor held sway; in the east, Sauron was the dominant power. Twice in that era the Númenóreans swept Sauron’s forces aside like chaff, and while the first time they pulled back to their island kingdom, the second time—in the last century of the Second Age—they briefly ruled all of Middle-earth, except for some of the small Elven realms. The Third Age began with Sauron’s almost-total unipolar control, which was defeated by the Last Alliance of Men and Elves and replaced by the more benevolent hegemony of Arnor and Gondor. But after the northern kingdom was destroyed, and after Gondor’s brief hegemonic moment in the 12th century of this Age, Middle-earth devolved into a multi-polar arrangement with several power blocs: even a reduced Gondor was primus inter pares but other powerful states existed, such as Mordor, Rohan, Rhovanion, Harad, Erebor, and the Elven realms such as Thranduil’s Woodland one. The Reunited Kingdom of Elessar (Aragorn II), which to a rejuvenated Gondor added the old Arnor—think the Byzantine Empire successfully re-integrating the old Roman Western Empire—was approximately the same size as Gondor at the height of its power 1800 years earlier, but hegemonic, not imperial. This situation continued into the Fourth Age, as far as Tolkien’s history records. 5) Strategy, tactics, leadership and good militaries won wars—not magic. Despite its reputation as a fantasy world, Middle-earth is very much one where, as Tolkien put it, “miles are miles, days are days, and weather is weather.” OK, there are exceptions to this: at one crucial point in the Third Age, the powerful Elf Galadriel sent a time-slowing fog to encompass the ancestors of the Rohirrim riding to help Gondor defeat a massive Easterling and Orc invasion. And later, of course, Sauron is finally discorporealized by melting his One Ruling Ring. But in both cases, it was warfare that actually brought about victory (even if indirectly, in the War of the Ring). In almost all of the 24 most important conflicts across space and time in Middle-earth, a commander would have been better off having attended Minas Tirith Military Academy than, say, Saurman’s School for Wayward Wizards. Aragorn moved from a non-state asymmetric warrior (Ranger of the North) to commander of a state military (leading the combined Gondorian heavy infantry and Rohirrim heavy cavalry) and, then, to actual King. That reforged broken sword didn’t hurt, but it had no magical powers beyond the ability to inspire. 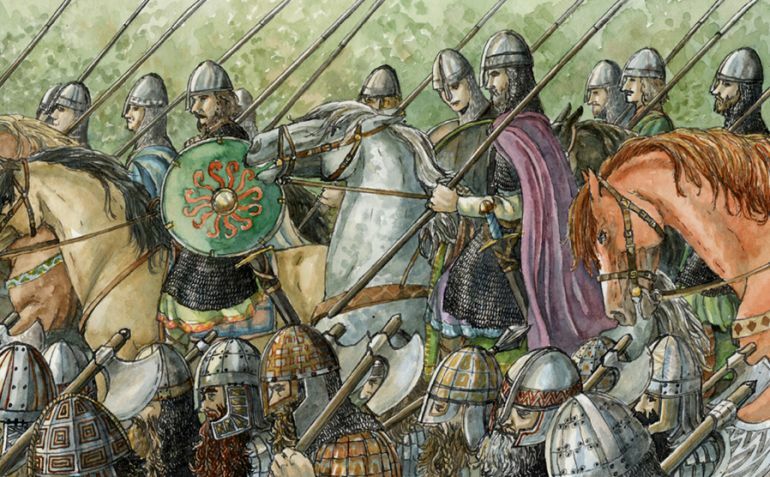 The most important battle of the Third Age (if not the biggest), that of the Pelennor Fields, was won when Théoden King of Rohan broke the lines of Mordor by leading a cavalry charge—not by Gandalf besting the Witch-King in wizardry. And so on. 6) Hobbits were simply a smaller branch of Men—and Orcs were a debased one. Despite being depicted in The Lord of the Rings and The Hobbit movies with pointed ears, Hobbits were not fairy- or Elf-like at all but were, in effect, simply diminutive men and women. They spoke the same language(s) as Men in Middle-earth, got along better with Men than Elves or Dwarves (as in Bree, especially when drinking at The Prancing Pony), and had no magical powers. And as a matter of fact, they were even shorter than shown in the movies, averaging 3 ½ feet in height—which was half that of the average Númenórean (or Arnorian or Gondorian, in the earlier Third Age) and the source of the term “Halfing” which was often applied to Hobbits. Being so small and physically ill-suited for warfare did not, of course, detract from their courage in other ways—such as transporting a certain powerful item long distances against overwhelming odds, or dispatching the second-most-powerful evil being in Middle-earth with a special Númenórean knife to the back of the knee (thus Merry actually killed the Witch-King, not Éowyn—sorry, fan-girls and -boys). As for Orcs and Goblins: the theory as to their origins—“they were Elves once, taken by the Dark Powers, tortured and mutilated”—which Saruman advanced on-screen is but one of several which Tolkien himself considered in his writings. He also mused that Orcs and Goblins had been some type of “upright beasts”, who were taught rudimentary organization, weapon-using and speech by Morgoth; or that they were Men who had been reduced in morality, stature and intelligence to that lower level. 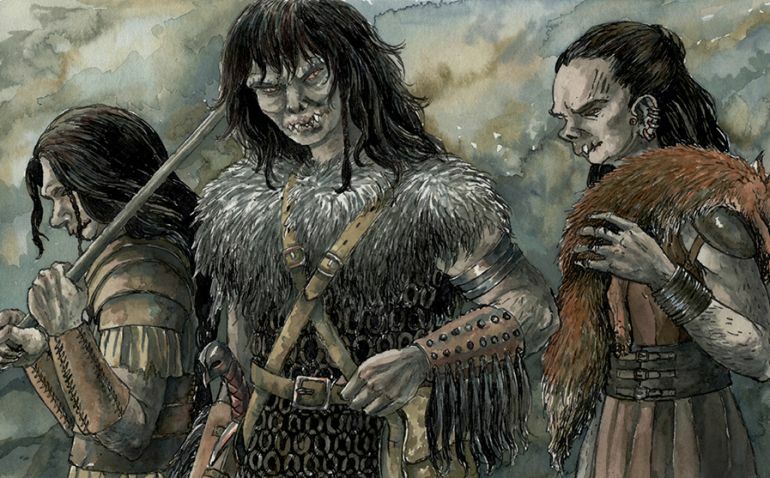 Tolkien in his later writings leaned toward the latter explanation, and explicitly said that the “almost Man-high” Uruk-hai—which, unfortunately, are shown as large as Men and Elves in The Lord of the Rings movies, and made even bigger in The Hobbit films—were a cross-breeding of Men and Orcs (not gestated in some underground incubator), which meant either there were female Orcs, or some very unfortunate human women. 7) Wizards were Middle-earth Special Forces. After Middle-earth’s satanic majesty, Morgoth, was defeated and removed at the end of the First Age, his batman Sauron eventually took up his mantle and tried to conquer the world. In the Second and Third Ages, Men (humans) were coming into ascendance, and so Sauron was mainly their problem (as Morgoth had been for the Elves). After Númenor’s destruction, Sauron’s chances improved dramatically and so, about a millennium into the Third Age, the Valar sent five Wizards with explicit orders to organize the resistance to Sauron and not to confront him directly with power. The two Blue Wizards disappeared into “the East” and were never heard from again. Radagast the Brown remained good but turned into something of a animal-loving hippie and proved of little help. Saruman the original White did counsel Gondor and the Elves in combating Sauron, and even helped them at times push back the Nazgûl; but eventually he decided to create his own Middle-earth Prussia at Isengard and bid for dominion himself. Only Gandalf stayed within his mission parameters for some two millennia: advising Men, Elves and Dwarves on grand strategy; befriending and mentoring Middle-earth’s greatest warrior and leader, Aragorn; setting in motion the destruction of Smaug, whom Sauron might have used to terrible effect; and last but not least, assisting Bilbo and then Frodo on what to do with the One Ring. Gandalf exemplified being able to think like the enemy, and outwit him, whereas arrogant Sauron underestimated the Grey-then-White Wizard as only a cleverer version of Radagast—to his eternal regret. 8) Morgoth, Sauron and their minions were landlubbers all. As Tolkien put it: “at no time did Morgoth essay to build ships or make war by sea. Water all his servants shunned, and to the sea none would go willingly, save in dire need” (The Silmarillion, p. 120). This, to put it mildly, would have been a major impediment to political and military strategy by either aspiring demi-god, or their subcommanders such as the Balrogs or Nazgûl. Think how much more effective Morgoth or Sauron would have been had they had naval forces to interdict, harass and attack, respectively, coastal Beleriand or Eriador. Sauron did have some de facto naval assets in the form of the Corsairs of Umbar, originally Men of Gondor who broke away with many ships during Gondor’s civil war in the 15th century of the Third Age. But he seems not to have used them against (or been able to persuade them to attack) Minas Tirith until very late in War of the Ring. Orcs of any stripe avoided not just the oceans but the coasts of Middle-earth. Being limited only to ground operations put Morgoth and Sauron at a severe tactical and strategic disadvantage vis-à-vis Númenor and, later, Gondor-Arnor. 9) Dwarves never rode horses. Or ponies. Or war pigs. Peter Jackson put Gimli (by far the best Dwarf, in any Age) on a horse in The Two Towers. Then he upped the ante by putting all 13 Dwarves on ponies and jumped the shark, er, Watcher in the Water, in Battle of the Five Armies by having Dáin II and the Iron Hill Dwaves ride war pigs. (So why didn’t PJ just go whole hog and use the Black Sabbath song?) The canonical problem is that not only, according to Tolkien, would a Dwarf never ride a horse; but Dwarves alone of all Middle-earth’s peoples never domesticated any animals. They were too busy mining, smelting and fighting, it seems. It’s worth speculating whether this total lack of any animal husbandry might have contributed to the eventual extinction of the Dwarves, since along with this there is no indication that Dwarves engaged in any agriculture at all but relied on trade (especially with Men) for their foodstuffs. In military terms, this meant that in Tolkienian reality the Dwarves fought solely as heavy infantry and had no cavalry, instead relying on allies among Men for such things. It’s logical to assume that after the near-apocalyptic War of the Ring and Sauron’s final defeat that peace would have broken out all over—as Aragorn says after his coronation in The Return of the King: “let us together rebuild this world that we may share in the days of peace.” The problem is that Gondor’s enemies—mostly Men—did not dissolve with Sauron, and according to Tolkien the combined army of Gondorian infantry and Rohirrim cavalry campaigned, for some years into the Fourth Age, northeast beyond the Sea of Rhûn (against nomadic Easterlings) and south into the deserts (to subdue recalcitrant Haradrim). But in the Reunited Kingdom, and in the lands behind, the Elves, Dwarves, Hobbits, Ents and Men did dwell in peace. Dwarves going to war on foot. High Towers and Strong Places: A Political History of Middle-earth is available in print from Amazon, Barnes & Noble, Books-a-Million and in both print and e-version direct from the publisher, Oloris (where it’s still on sale!). Timothy R. Furnish, PhD, is an author, scholar, commentator and counter-terrorism analyst; with three decades of education and experience in the history, religion, culture, politics and geo-politics of the Islamic world from Casablanca to Jakarta. You can reach him here. 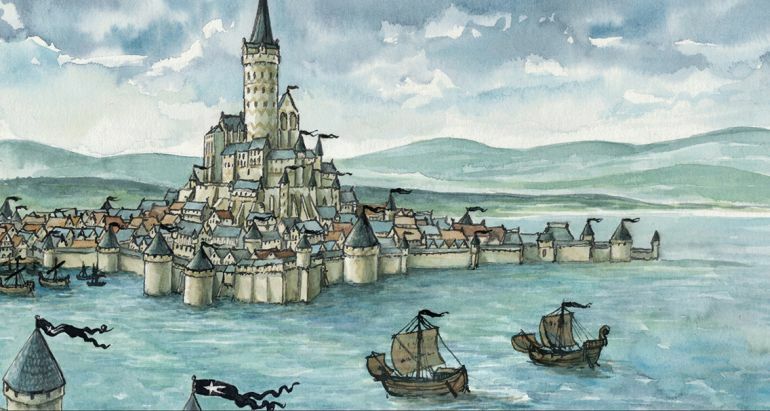 The featured image and the other images (except the Middle-earth map) used in the article are all taken from the cover and illustrations of High Towers and Strong Places: A Political History of Middle-earth, with the author’s permission.